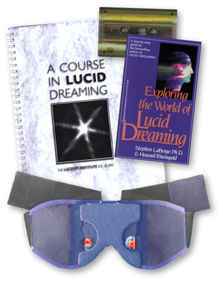 A Lucid Dreaming Mask is A Device capable of inducing Lucid Dreams. Usually such devices take the form of a comfort sleeping mask and include electric circuit board. The board serves as a timer and sends visual and sound signals to the dreamer. 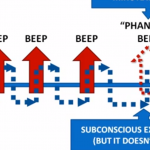 Most advanced ones detect a REM phase (R E M Rapid Eye Movement sleep cycle stage, the phase of vivid dreams.) and send signals at the appropriate time. The first device of this kind was invented by Stephen Laberge, PHD, who has been doing a considerable research in the field of lucid dreaming for over many years. As far as I know, Stephen was the first (or at least, one of the first in the scientific world) who assumed and later proved consciousness in the dream state by checking body movements (fingers, eyeballs, etc.) while someone is dreaming and aware about this fact. In this state, they were asked to send repeated signals like four eye ball movements every certain amount of seconds. This work proved that time has the same density in the REM dream and Awakened stage. Later, there was research to prove that these two stages are really similar or even identical. The positions of the eyeballs in the dream and for real body are the same. This was proven, also. This fact is used by the Lucid Dream Mask (described below) to connect with the dreamer. Another interesting piece of work by Laberge and his followers is the creation of a Lucidity Institute and eventually the Lucid Dream Machine based on infrared sensors, which are designed to track movements of the eyeballs. All current mask solutions (e.g. 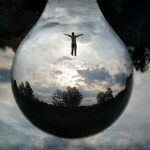 REM Dreamer is another similar product) are based on this invention. So, I wanted to try the one from the original source! 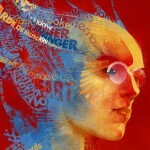 Unfortunately, Novadreamer was discontinued a while ago. The Lucidity Institute claimed the work on Novadreamer II is designed to be an improvement of its predecessor. I subscribed for their news and hopefully I will try the new version as soon it’s been released. In the meanwhile, I bought and tried a similar mask from their competitor. Stephen’s idea is to send a reminder signal when you’re dreaming to induce a lucid dream (DILD, Dream-initiated Lucid Dream). There a lot of implementations of the idea in the internet. Instead of creating my own device I decided to save some time and bought one from a small company with moderately poor support and some billing problems. They had two versions: base, which is quite adjustable and could send visual signals and basic sound beeps; and advanced one, which could send prerecorded(in 16 bit WAV or mp3 format) voice prompts. The comfort of the advanced version is quite higher. I had a really hard time to fall asleep with the base one. And I’m going to prove it on my experience for you. We won’t count cases where lights and sounds just waked me up. It’s like you’re lying in bed in complete darkness, and suddenly you disturbed by lights and voices. 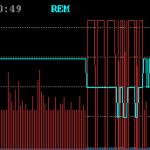 I’ll show these moments on the EEG; this might be my specifics or failed to set up a device properly (these particular versions have so many different options…). REM sleep stage doesn’t necessary makes you move your eye balls (like in my case). There are dreams beyond REM stage, which I’d like to investigate, also. Subconsciousness interprets the mask signs its own way, which is usually different from your expectation. This fact dramatically decreases any chances for success. I tried to describe 1 and 3 in this article. 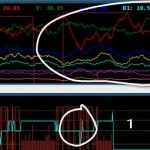 2 is described in another one in more details as an experiment with custom EEG. The bottom line is everything is working as designed and you’re capable of seeing prompts. The real questions are: Are they useful for you? Will your mind play the same joke to you as mine? The same joke, which it’s usually playing when you’re tired, and the sound of the morning alarm appears so natural in your dream, so you consider that as a part of your real (dream) world. As usual, any concerns or fresh ideas from you are really appreciated. Did you have similar experiences? Have you ever tried lucid dreaming mask? Have you overcome similar troubles? How?